Middlebury, CT, USA – At Quassy Amusement & Waterpark, it’s about “Reverse Time” for the 2016 season as the family-owned property opens Saturday, April 23, for its 108th year. Quassy will introduce a new family thrill ride, Reverse Time, this year as well as a new waterslide complex and other improvements, according to park officials. Reverse Time, themed as a giant clock, accommodates 24 riders seated in a circular configuration facing outward. As the ride starts to spin it is lifted into the air with the supporting turntable rotating in the opposite direction. Guests will dip and dive as the ride reaches a maximum speed of 20 revolutions per minute. Mid-cycle, the ride will change direction adding to the experience. 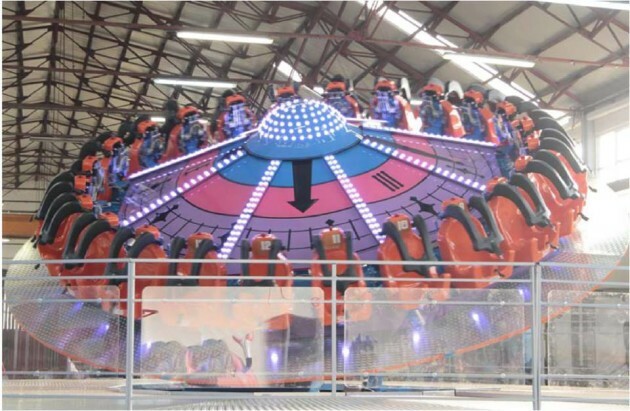 Quassy worked with SBF/VISA Group, the Italian manufacturer, in devising the color scheme for the attraction with the park’s artist creating a logo for the new ride. Rides 4U, Somerville, N.J., represents SBF/VISA in the United States. Reverse Time will also feature a state-of-the-art light-emitting diode (LED) lighting system and an over-the-shoulder restraint system. The new attraction will be located in the heart of the lakeside park where the former Trabant ride was situated. A staple at Quassy since 1965, the Trabant was retired at the close of the 2015 season. Reverse Time will be ready to thrill guests on the park’s opening day. Park officials noted that early season weekends will have a new operating time of 11 a.m. to 5 p.m. The complete 2016 operating schedule is at www.quassy.com. The off-season at the lakeside property has been anything but quiet as construction workers have been busy putting the finishing touches on Slide City, a new five-slide complex for children at Splash Away Bay. “We really saw the need for more waterpark attractions geared toward youngsters,” Quassy President Eric Anderson said of the project. “We introduced an interactive splash pad a couple of years ago and Slide City will greatly enhance the experience for younger guests. Two serpentine slides called KIDZ Twisters™, a two-person ProRacer ™, KIDZ Bowl 14 ™ and a KIDZ MiniRiver™ will make up the complex. Four of the slides will end in shallow troughs while the bowl unit will gently send riders along the wall of a circular-shaped landing prior to exiting. The KIDZ Bowl will be the first outdoor unit of its type in North America. The bowl and enclosed twisters slides are designed for children up to 48 inches tall. The new slides were provided by ProSlide Technology, Ottawa, Ontario, Canada. Splash Away Bay waterpark and Quassy Beach both open for the season on May 28. Anderson also announced that three huge waterslides are in the works for future expansion of the waterpark. Those slides will be located in an area now occupied by picnic tables on the north side of the property. Quassy’s popular fleet of paddle boats located on Lake Quassapaug will also get a boost this year with the addition of four new four-seat family boats. In addition, the park will also offer kayak rentals for the first time. Another popular attraction for smaller children, the playport, got an extreme makeover in the off-season. Now called Spaceport Quassy, the expanded play area will offer more activities for youngsters. The award-winning Wooden Warrior roller coaster will sport a new vantage point for guests wanting to capture photos of the exciting ride. The Eagle’s Nest Observation Deck, located adjacent to the exit ramp of the thrill ride, will provide guests with a bird’s-eye view of the coaster as it screams back toward the loading station. Quassy’s maintenance staff built the deck during the off-season. Also, the park’s classic Allan Herschell kiddie boat ride has been refurbished to original factory specifications, including lights and a canvas top. The ride has been a staple at the Quassy since 1952. Quassy Amusement Park & Waterpark features more than two-dozen rides and attractions. The lakeside property is also home to Splash Away Bay waterpark with dozens of ways to get wet. Other rides include the award-winning Wooden Warrior roller coaster, Music Fest, Yo-Yo super swings, Free Fall ‘N’ Drop Tower, Grand Carousel and more.